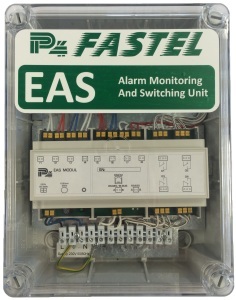 The EAS module allows alarms from static inverters and central battery systems to be monitored within a FASTELink computer addressable emergency lighting system. In addition the EAS unit is provided with 4 remotely controllable output channels to enable the switching of equipment. In this way a static inverter or central battery system can be remotely put into test. The EAS module automatically records changes to inputs and outputs onto the connectedFASTELink M-web system. The EAS unit is normally mounted adjacent to the static inverter or central battery system to be monitored and if required can be DIN rail mounted inside the equipment. Suitable Location Inside Static Inverter or CBS or in suitable wall mounted box adjacent to Static Inverter or CBS.